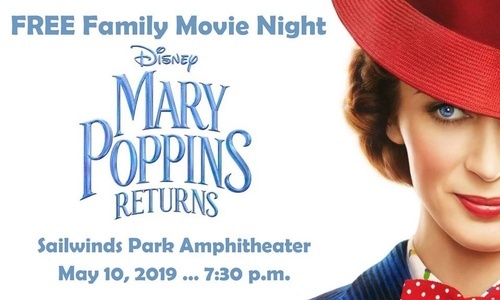 Bring the family and join in the first FREE Movie Night of 2019, featuring Disney’s Mary Poppins Returns on Friday, May 10. Show time is approximately 7:30pm. Bring a blanket or lawn chair. The City of Cambridge is sponsoring the movie and providing free drinks and popcorn while supplies last. This is a family-friendly event. At the Amphitheater at Sailwinds Park (next to the Dorchester Visitor Center), 2 Rose Hill Place in Cambridge, MD.